PacifiCorp is ramping up its renewable energy component with the recently completed Marengo projects in Washington State-and more wind projects to come, in Wyoming. While PacifiCorp has a rich renewable energy heritage-with a large number of well-established hydro electric projects in its generation portfolio-the company has ramped up its renewable resource component with recently completed wind power projects in Washington State and Oregon and will further its renewable resource objectives with several more projects in Wyoming. The Portland, Oregon-based company is the third largest electric utility west of the Mississippi, with approximately 1.7 million customers in six states. PacifiCorp operates as Rocky Mountain Power in Utah, Wyoming and Idaho, and as Pacific Power in Oregon, Washington and California. The company owns approximately 70 generating plants across the West, with a net capability of 9,286 megawatts. PacifiCorp's renewable energy commitments go back a number of years. After it was purchased by European power giant Scottish Power in 1999, Scottish Power said that PacifiCorp would add 1,400 megawatts of renewable resources to the generation portfolio by 2015. The utilities and power business, of course, is a dynamic business space, and in 2005, Scottish Power sold PacifiCorp to MidAmerican Energy Holdings Company, a company controlled by Warren Buffett's Berkshire Hathaway, for $5.1 billion. As part of a package presented to regulatory authorities, MidAmerican made multiple commitments toward renewable energy, including that the company would have 100 megawatts of new wind power in service within a year of the deal closing, and a commitment to have 400 megawatts of new renewable resources in the portfolio by the end of 2007. They also reaffirmed the larger, 1,400 megawatt commitment. "This was an important area for our regulatory stakeholders-those three commitments were significant," says Mark Tallman, PacifiCorp's vice president of renewable resource acquisition. The company has been quick to act on those commitments. Two of several new wind facilities in PacifiCorp's wind portfolio are the Marengo Wind Projects in Washington State. procurement of the first project." Sited in a mainly agricultural area in the southeastern part of the state, near the scenic community of Dayton, the first phase of Marengo consists of 78 Vestas 1.8 megawatt turbines. The second phase has 39 Vestas 1.8 megawatt turbines, for combined total production capability of 210.6 megawatts, all of that directly interconnected to the PacifiCorp transmission system. The State of Washington and local counties have been supportive of renewable energy, and a number of wind projects have been built in the state in recent years. Wyoming will play a major role in supplying wind power for PacifiCorp going forward. "We have five wind projects in Wyoming that are new to our portfolio as well as three others being constructed by third parties that we will buy 100 percent of the output from," says Mark Tallman, PacifiCorp's vice president of renewable resource acquisition. "Three of the projects are on PacifiCorp-owned land that includes lands where strip mining used to be done for coal, and it has been reclaimed and will be used for wind farms. That's a great story in itself." Wyoming, of course, is served by PacifiCorp's Rocky Mountain Power electric utility, and is also one heck of a wind-rich state. "There's lots of land and lots of opportunity," says Tallman. In fact, when PacifiCorp struck the purchase with RES Americas Inc., the first phase of Marengo was permitted and ready to go. "We executed the contracts and they were breaking ground for Marengo almost the next day," says Tallman. "There were no additional approvals required. "By and large, the Marengo project has excellent support in the community," says Tallman. "Dayton is a small, rural community, and it's a community that Pacific Power serves. We were really pleased that the project could be in a community where we provide power. "And we feel very good about the Marengo project in relation to the economic development it brings to an area we serve." Area residents are quite used to having wind turbines around. Not too far away is Puget Sound Energy's Hopkins Ridge 157-megawatt project, built in 2005. 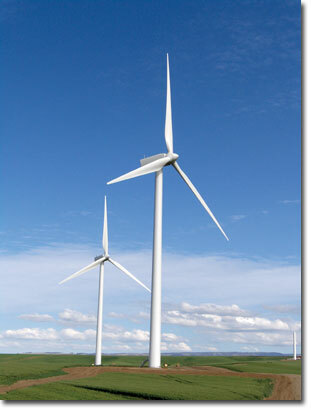 Hopkins Ridge was also developed by RES Americas Inc., and also utilizes Vestas 1.8 megawatt turbines. Although Marengo consists of two separate projects built at separate times, PacifiCorp contracted for each project via a single negotiation, explains Tallman. "RES was already well along with Marengo. When we did the transaction for Marengo, we embedded the ability for PacifiCorp to pursue the second project." There were, he says, some synergies in moving resources from construction of the first project to the second. "There were some benefits in that area. RES knew the second project was on the landscape, so about the time when they were finishing up work for the first project, they were able to do some prep work for the second project. "It would have been a bit more seamless if not for a delay in permitting due to an appeal from a small group of local residents. However, RES was still able to get in and build some roads for the second project, in preparation for the turbines arriving the following spring." In terms of turbine equipment, Tallman echoed comments from other utilities about the challenge of turbine supply and demand. "With that mismatch, we felt fortunate to be able to procure a turbine model that was well established, by one of the largest turbine manufacturers in the world. "When you are a utility, and you are adding this type of resource, you always take comfort in adding a proven generator. The fact that Vestas is who they are dovetailed well with our overall objectives." Vestas is providing turbine operations and maintenance for both projects at Marengo. There also are some benefits there-Vestas is already firmly established in the area, having already served the Hopkins Ridge wind farm. "They don't even need to use the operations and maintenance building we have on the site," notes Tallman. Another benefit is that Vestas has its North American sales and maintenance headquarters in Portland-where PacifiCorp's head office is located. "That's made it convenient to do business with them." Added to that is the fact that Vestas and RES Americas Inc. had already worked together on a number of projects, including Hopkins Ridge. "We found the construction team and turbine supply team worked well together." PacifiCorp has been pleased with the operating results of the Marengo project. The site is in a good wind area, Tallman notes. "It produces in the low 30's (referring to capacity factor), which is what you would generally expect to find in the Pacific Northwest. Being directly connected to our system is a benefit and both projects have performed to expectations since they went into service. The first project went into service in August 2007, and the second project went into service this past June." 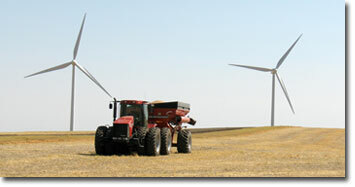 While PacifiCorp found the best business approach with the Marengo projects was to purchase the project rights from a subsidiary of RES America Inc., and then have an RES affiliate construct it, with PacifiCorp supplying the turbines, it generally takes a variety of approaches with wind power projects-there is no hard and fast business model, Tallman explains. "We told our regulators that we would take a multi-faceted approach to acquiring renewable resources and that is exactly what we have done," he says. "We've entered into transactions that range from buying wind power projects that are nearly complete to buying the development rights and entering into a construction agreement and then self providing the turbines-like we did with Marengo. "We've also done projects where we have obtained the bare essentials of the underlying development rights and then we've undertaken the rest of the development process, procured the turbines and then acquired construction services separately. And we've entered into a number of Power Purchase Agreements with third parties where the third party will do all of the development, construction and be the owner. In those cases, we buy the power output but our customers don't have access to the project when the contract ends, unlike our owned projects." PacifiCorp strives to be commercially creative, to deliver the best value, he added. "We have been in this business for the better part of the last century and our objective is to deliver the best deal for our customers during this century." And coming closer-now that we are in 2009- is achieving that 1,400 megawatt commitment. "We're firmly committed to that, and we're well on our way to meeting that objective early," says Tallman. In the first half of 2008 alone, two projects were placed in service: Marengo II and another Washington project, Goodnoe Hills, a 94 megawatt wind farm near Goldendale, Washington. Goodnoe Hills began operations in June 2008, and uses 47 REpower turbines. Each turbine is 2 megawatts in size. From what Tallman says, the transition into wind power generation has gone fairly well for PacifiCorp. In some ways, that's not a surprise, since the company's roots date back to renewable power developments during last century, with major hydro power projects in the Pacific Northwest. "The company's portfolio has always been well diversified, not only in terms of the different types of generation resource, but also with geographical diversity and a vast transmission system," says Tallman. "We always had a strong hydro component in our mix, long before we started developing wind projects or adding wind projects from third parties to our portfolio," he added. "In the transition to wind resources, we were just waiting for the wind power industry to develop to the point where utility owners could step in and build, own and operate like we've done with other resources over the years. In some ways, you could say we were waiting for them to become utility-grade and we're sure glad they have showed up in force." Developing wind power is one thing, but utilities have quickly discovered that moving that power around can sometimes be the most challenging part. As part of achieving that, PacifiCorp has launched Energy Gateway, an ambitious transmission expansion program that will add more than 1,900 miles of new transmission lines across the West. Announced in 2007, siting and permitting processes are now underway for many segments of the planned expansion. Major segments of the estimated $6 billion project are scheduled to come on-line by 2014. The project involves building more than 1,900 miles of new transmission lines across the West, including Wyoming, Utah, Idaho, Washington, Oregon and the desert southwest. The Energy Gateway is expected to provide access to areas with strong renewable development potential, whether wind, solar, biomass or geothermal. PacifiCorp sees a robust electrical transmission system as key to its ability to meet its load service obligation and to the region's energy future, both for renewable energy and more conventional energy sources. As one of the largest owners of transmission in the West, PacifiCorp is well aware of the constraints on the existing system, and the significant upgrades needed to relieve these constraints. And while benchmark energy prices may be coming down-oil prices now stand at about $50 a barrel vs. their peak of nearly $150 a barrel-electrical energy consumers are still looking for renewable power. Tallman notes that the company's Blue Sky renewable energy program has had outstanding success with customers, and they see that continuing. Added to that, three of the states PacifiCorp operates in-Washington, Oregon and California-have mandated Renewable Portfolio Standards. Blue Sky is a program where customers can create a personal portfolio of renewable resources. "Based on the success of the program, it is clear our customers want these types of resources," says Tallman. Tallman agrees that utilities, and PacifiCorp, have a lot to do, both in terms of transmission upgrades and in generating additional renewable energy. "That's why we've been working to do as much as we can, as fast as we can. I think the proof is in what we've been able to achieve in such a short period of time." The industry still has issues, such as rising turbine costs, Tallman says. "Turbine manufacturers have to be careful they don't shoot themselves in the foot, and price themselves out of the market." That said, the future can indeed be bright for wind power, and there's plenty of work to do-and it's exciting as heck, to boot, says Tallman. "I've worked for the company for 23 years, and this has been by far the most exciting time in my career."